"We use 3D models like this to see if we like the animation — is it telling a story? — and the timing, before finishing it off by lighting and rendering it [adding details such as hair]." "This is the same shot at a later stage. Hair is a real pain. Our lead technical director Nicolas Hernandez did an amazing job of making it work by painting n the individual hairs." "The bloke in the figure-hugging leotard moves through the frame as a reference for the director and editor. The markings delineate his muscles, providing reference for our animators as he moves." "Here is the model in its most basic form, which allows us to check that we've got the expression and movement right. Those markings on the guy's suit have proved helpful for this." 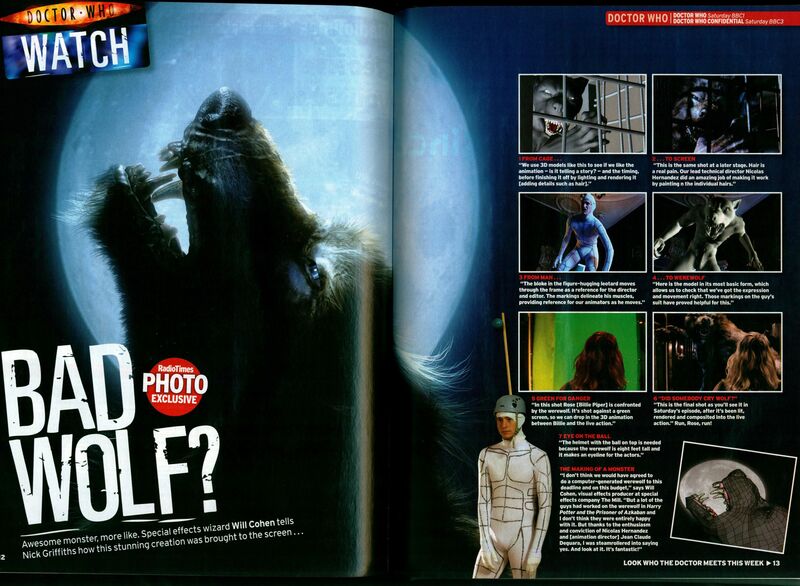 "In this shot Rose [Billie Piper] is confronted by the werewolf. It's shot against a green screen, so we can drop in the 3D animation between Billie and the live action." 6 "Did somebody cry wolf?" "This is the final shot as you'll see it in Saturday's episode, after it's been lit, rendered and composited into the live action." Run, Rose, run! "The helmet with the ball on top is needed because the werewolf is eight feet tall and it makes an eyeline for the actors." "I don't think we would have agreed to do a computer-generated werewolf to this deadline and on this budget," says Will Cohen, visual effects producer at special effects company The Mill. "But a lot of the guys had worked on the werewolf in Harry Potter and the Prisoner of Azkaban and I don't think they were entirely happy with it. But thanks to the enthusiasm and conviction of Nicolas Hernandez and [animation director] Jean Claude Deguara, I was steamrollered into saying yes. And look at it. It's fantastic!" APA 6th ed. : Griffiths, Nick (2006-04-22). Bad wolf?. Radio Times p. 12. MLA 7th ed. : Griffiths, Nick. "Bad wolf?." Radio Times [add city] 2006-04-22, 12. Print. Turabian: Griffiths, Nick. "Bad wolf?." Radio Times, 2006-04-22, section, 12 edition. This page was last modified on 9 February 2014, at 14:55.